a peek inside the fishbowl » Blog Archive Healthy lunchbox granola bar recipe: this is the winning recipe! Healthy lunchbox granola bar recipe – this is the winning recipe! Anyway, after a lot of searching I found a healthy granola bar recipe to make for my kids, but after reading a few of the comments posted with the recipe I decided to alter it a bit and make it my own. * I picked up a lot of these ingredients at the bulk food store. I’ve also made a batch with sunflower seeds and whole flax seeds. They were just as great! I find that if I add raisins and cranberries the bars become sweeter and chewier. You’ll have to experiment and figure out what you like best. 1. Preheat the oven to 350 degrees. Grease 9 x 13 baking pan. 2. In large bowl, mix together the oats, brown sugar, wheat germ, flax, cinnamon, flour, raisins and salt. Make a well in the centre, pour in the honey, egg, oil and vanilla. Mix well. Pat the mixture evenly into the pan. It will be sticky. 3. Bake for about 30 minutes, but watch the baking time. If you leave them in too long they’ll be dry. I like mine a bit chewier so 30 minutes works for us. Cool for 5 minutes, then cut into bars or squares. Do not allow the bars to cool completely before cutting or they will be too hard to cut. So. I mixed the ingredients. The original recipe said to use your hands to mix, which I did, and I realized I really didn’t need to. Oh well. After I was done I licked ALL TEN FINGERS because the mixture was so good. I poured the mixture into the pan and popped it into the hot oven. After about five minutes I realized that the mixture was a little too wet. And THEN I realized it was because I forgot to add the flour. I pulled it out, sprinkled the flour on top, mixed it in, and put it back into the oven. PEOPLE, THIS IS THE WAY I COOK THINGS. BUT they were still pretty good. I’m not sure if they’ll be sweet enough for everyone’s liking. I reduced the amount of sugar, but I found the raisins made the bars sweeter. The girls like them, and that’s what matters to me. If you try them let me know how they turn out for you! Any questions? Please let me know. 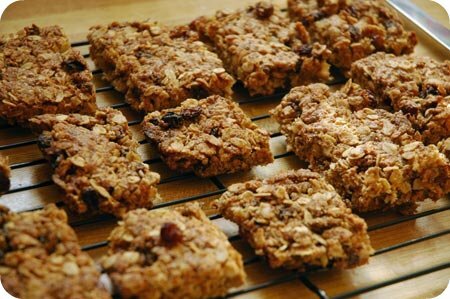 This recipe for granola bars is still a family favourite! My kids love bringing them to school. I bake them on Sunday afternoons for the week ahead. You can cut them as large or small as you like. For this batch I cut them into bigger bars before I wrapped them in foil and popped them in the freezer… although I’m not sure why I bother, because they disappear so quickly. 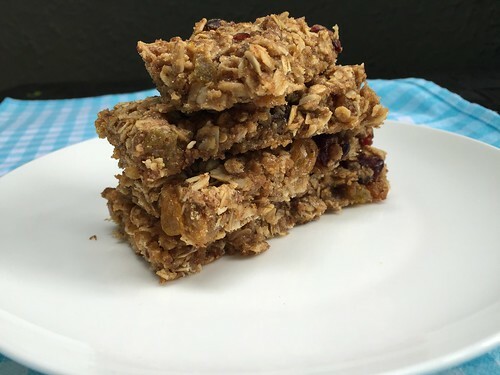 Share the post "Healthy lunchbox granola bar recipe – this is the winning recipe!" 128 Responses to "Healthy lunchbox granola bar recipe – this is the winning recipe!" I will give them a try this weekend. They sound like they would be good. Unfortunately, my girls aren’t fans of dried fruit so I might have to add chocolate chips which sort of defeat the purpose a little…but still healthier than store bought I’m sure. Are sunflower seeds okay, I’m guessing they are…and pumpkin seeds would be so perhaps I could add those instead of the dried fruit? Porter: does that include dried cherries or blueberries? I bet you could easily sub sunflower seeds or pumpkin seeds, i’m guessing they’d be okay since they’re not a peanut or a tree nut. Oooh, looks like a wonderful recipe, I will have to try this one as I too have been looking at the stuff on the shelves wondering what I could make that was better. You know, I’ve had lots of people recommend the laptop lunch system but it won’t work for me for one big reason: the sandwich. And these don’t accommodate them all that well. Despite Emma and Sarah’s limited sandwich repretoire the good ol’ fashioned sandwich is still an effective way of feeding someone. You could still achieve a litterless lunch without buying a laptop lunch system. – don’t buy any single serving foods for their lunch. Bar, cookies, yogurt, fruit cocktail, crackers, chips etc. Even juice & milk. All of that stuff can easily be taken from one larger container and poured into a smaller reusable containers. Continuing on the tangent, I love the laptop lunch box for my oldest. Sandwiches cut in half do fit into one of the sections, but what I like most about it is that it encourages variety in the lunch- fanastic for someone who is starting to make their own choices. It won’t work for my daughter because it is difficult for little hands to open. For her I have been considering the Greentainer, a stainless steel round container with two compartments that looks ideal for school snack breaks. I do employ a lot of what you said but slide a bit sometimes….It’s great that my daughter’s teacher is very ‘green’ and all garbage comes back home so that alone is incentive! btw we should meet up someday as i am in Ottawa too! Ooo…I want to try these. I’m sure Jake would love them. I made the granola bars and they are YUMMY. I can’t stop eating them!!! They really taste like granola bars (very good granola bars in fact)! Also very easy to make. I’m so glad you tried them and liked them Jennifer! I tried the granola bar recipe for our camping trip last weekend, and made almost the same changes you did! They were a big hit. Thanks so much for finding it. Even with 1/2 c. brown sugar, I still found them too sweet (all those raisins and cranberries) so I’ll try reducing the sugar even more. I think I’ll try more oats and the flax seed next time too. Sam and I made these yesterday after school, and they’re a hit ! I was also wondering if you’ve tried making granola? (great for kids either on it’s own or on top of vanilla yogurt)…. anyways my favorite brand is BearNaked and I’ve been looking for a similar recipe. I’ll keep searching and post if I find anything worth while. Hmmm. I’ve never tried making my own, but am game to try. If you come up with a good recipe let me know! I made the lunchbox granola bars, but somehow forgot the brown sugar! They turned out fine. Still tasty for me and my ten year old son, but not quite sweet enough for my youngest boy. Thanks for the great recipe, now a staple in my kids’ school lunches! I modified the recipe slightly, using only 1/4 cup sugar, no cranberries, and 1/4 cup canola oil with 1/4 cup applesauce. The second time I made them I replaced the raisins and cranberries with chocolate chips – these are a huge hit! I tired recipe, I think I must have missed something. It went in rather dry.. I’ll hav to try it again. Hi there, this recipe sounds great, I’m just about to give it a try. I’m going to toast the oatmel in the over first (a genius idea I found in an online oatmeal cookie recipe that really adds to the texture/flavour) and perhaps some toasted coconut. Wish me luck. I have six children, and store bought granola bars do not go very far. I tried this recipe and my kid loved it. I doubled the batch and baked it on a large cookie sheet. I have since added apricots cranberries cornflakes or whatever else I have on hand, and it always turns out great. Thanks for your comment Michelle – you make a good point. It’s definitely a great recipe for those trying to make good (and healthy!) food for larger families. I these are the best granola bars on the internet! I’ve tried a few different recipes. I must have made about 20 batches of your bars since Christmas. My 11 year old son has type 1 diabetes and an allergy to nuts, and these are a lunchbox stable. They have a low glycemic load, and make a great snack with nature-a brand soy milk (lower in carbs than most). Thank you for the granola bar recipe, I will try them for sure. for a while now, always turns out good, just make sure you stir your granola while it is in the oven and as soon as it smells good, well that is when it is ready. Enjoy! Oh and it is so much cheaper to make your own than to buy it, not to mention you control what goes into it! In a large bowl, stir together the oats, wheat germ, coconut, sunflower seeds and almonds. In a separate bowl, mix together the oil, honey (or better still, maple syrup) boiling water, brown sugar, salt and vanilla. Pour the liquid ingredients into the dry ingredients, and stir until evenly coated. Spread in a thin layer on a large baking sheet, on a bed of parchemin paper. Bake 60 to 90 minutes (trust me on this, 60 minutes is max) in a preheated oven. Stir every 30 minutes (I stir mine every 15 minutes with tongues) until lightly toasted and fragrant. Granola will crisp up more when cooled. If you wish, you can add dried fruit to your master piece, I like to use dried cherries and dried blueberries, I cut them up in small pieces and add to the cooled batch. Hummm, I wonder about white and/or dark chocolate chunks…. I made these granola bars for my husband and replaced the oil with apple sauce and he loved them! For a different granola bar I made one batch with 70% chocolate chopped up and coconut…and left out all the fruit and seed…they were awesome! This recipe has endless possibilities. I will add some seeds like flax and poppy, a banana, some cut up dried fruit in addition to what’s suggested. Once I go to bulk barn I’ll choose some dried fruit that will fit in nicely including dried apricots, some apple, etc. I can play with the spices and add or omit depending on who eats them- my kids have opposing taste buds. thanks for this recipe, I might even add some butter a la “Sally Fallon”! I might also add some chia seeds or some hemp hearts. I mashed a very very very ripe banana, and then made up the difference to 1/2 cup with oil – the banana was more than 1/4 cup, but it turned out great, and I can’t taste the banana. Just tried these and they are YUMMY! Question though. Once they are cool, do the bars hold their shape on their own when you pick them up to eat them? Mine are a little lacking in structural integrity. Perhaps I didn’t pat them down enough before baking? Julie: I like the idea of the mashed banana! Lee: I think patting the mixture down before baking is the key. Most of the time they hold together for me, sometimes they crumble (but the kids don’t seem to care)! I would line the baking sheet with parchment paper to reduce the fat, but otherwise this looks great. I am about to try it for my variety lacking boys! Just to update, once the bars were COMPLETELY cooled, they held together much better! I just popped a batch in the oven changed it up a bit by adding hemp seeds, and pumpkin seeds. I am celiac so I used gluten free flour so we will see how it holds up! Pretty excited. now to wait. If you use the canola oil in the recipe, measure it before you measure the honey. When you measure the honey in your “oily” measuring cup, you get much more of the honey out of the cup afterwards! – Added more applesauce than oil.. I think I might add all applesauce next time. I see no use for the oil. They are very hard not to eat while cooling! I ate a few pieces and am so full.. they were yumm-o! Thanks for the recipe! My fiance loves granola bars, so I wanted to make her something a bit more healthy than the store bought ones. She tried them last night, and said they were the best granola bar she’s ever tasted! 3 thumbs up, if I had the extra thumb! And thanks for the recipe! This recipe is absolutely fantastic. I made them 2 weeks ago with sunflower seeds and dark semi-sweet chocolate morsels instead of the dried fruits and they turned out to be amazingly delicious!I have since forwarded this recipes to other co-workers who have also been raving about this great recipe. YUM!!!!!!! !Thank you or sharing! This looks so good! My son has a nut allergy, so its impossible to buy healthy, inexpensive granola bars for my house. I’m going to try them, but will add crunchy sunbutter ( a great peanut butter subsititute) thanks! I really still can’t believe how much both my 2 and 4 years old loved them! This is such an encouragment to cook healthier for my family. this recipe gets 2 big thumbs up from me! I added whole flax unstead of ground. I also added sunflower and pumpkin seeds along with raw cashews. I threw in some chocolate covered Gogi berries for sweetness and dried cherries instead of raisins. Hi, it turned out perfect!!! I just have one question…are they fattening? Because I can’t stop eatting them,lol. I also would like to know if they are fattening. My son’s request for litterless lunches brought me to this recipe through a google search. I tried it with no raisins, added chocolate chips and sunflower seeds, whole flax seeds, and couldn’t find the right flour so I just used my all-purpose this time. Turned out great, maybe even too sweet, will vary it a little next time. The whole family loved them, even the kids! I just made these today and they are extremely crumbly…any suggestions for keeping them together better. Is this caused by too much dry not enough wet ingredients? or a case of not enough packing into the pan? Hi. These granola bars are fabulous. I like to “tweek” recipes after I make them once or twice. Try using NO oil, but 3/4 cup of applesauce (homemade, unsweetened, fresh); but unsweetened canned would also work. I also added 1/2 c of dried apricots, snipped into small pieces. I still added the cranberries & raisins & 1/4 c of chopped pecans & 1/4 c dried, unsweetened coconut. So far, this has been my 3 (adult) “kids: who are 19 yrs-21yrs & 23 yrs, as well as their friends favorite. I will likely keep trying things, but might not want to mess with a good thing. Also, I reduced cooking time to 23 minutes and they are very soft & chewy, the way we like them. One more thing…I sprayed my pan with Pam to reduce fat content! :) Enjoy these….they’re fabulous. My boyfriend Derek and I love a good granola bar after we go surfing in Tofino. But the bars at the local coffee shops were so expensive, so this time out I gave this recipe a try and everybody absolutely loved them. The one note I would make is that on the second batch I took the suggestion and added another 1/2 cup oats, and I found it made them way too crumbly. I also experimented with a recipe using molasses and maple syrup instead of honey (we ran out), and they were pretty tasty too. i just put mine in the oven…..they smell delish…i noticed thier was no nutritional info….. DOES ANYONE HAVE THE NUTRITIONAL INFO ON THIS RECIPE? Wow! These were wonderful! I made some this morning, following the recipe and baking directions almost the whole way (except I didn’t have any raisins so I put in dried pear instead and I also added half a cup of walnuts and 1/4 cup of almonds) and they turned out to be very chewy, tasty and sweet! Loved em’! i’d love to try this recipe! but i was wondering what can i substitute for the wheat germ? i don’t have any and i really don’t want to have to buy it just for this one recipe. is there anything else i can use? more flour? bran? thanks! I decided to try this for myself and my grandchildren. They were awsome although not quite as sweet as I like. I added Almonds, had no wheat germ but I will on the next batch otherwise as directed. I used olive oil as it was all I had. I’ll also use sunflower seeds next time. Chocolate chips may be another try option. These looks excellent, and I just don’t trust the ingredients in store granola bars. I used apple sauce (no oil) and added a table spoon of cocoa powder, sunflower seeds cranberries and apricots, and they are delicious! huge hit with my monkeys! I used 3/4 cup pure maple syrup instead of the honey and brown sugar, and then substituted 1/2 cup melted coconut oil for the vegetable oil and they turned out great! Yummyrecipe! I used apple sauce and oil, used 1/2 cup of spelt flour for the white flour, sesame seeds for the wheat germ, and didn’t have cranberries. These still turned out amazing! Thanks for a great recipe. I just made a wheat free version. I substituted the wheat germ with oat bran and the whole wheat flour with 1/2 cup brown rice flour, 1/4 cup cornstarch and 1/4 cup ground almonds. They are soooo tasty. MUCH better than store-bought gluten free granola bars. I have been making the original recipe, with some of my own tweaks for a couple years. For a chocolate granola bar replace the wheat germ with cocoa powder. I also add some chocolate chips and. A big hit here. Hi! I just made these. My husband and I are trying not to eat sugar or too much fat. I sweetened these with brown rice syrup and some honey. I substituted all of the oil with apple sauce; I did use some oil to grease the pan. They turned out really good! I am so glad I found this recipe! These sound great. Are they crunchy? My little guy is really on a crunch kick –might be teething… I’m tired of giving him the store bought ones that he loves to gobble up (of course, because they are so loaded with salt and sugar!). Delicious. I cut the sugar out completely, added sunflower seeds. My two girls (ages 5 & 7) loved them. A great nut free, healthy snack for school. Thanks! I like all the sub suggestions above and will try dome of them next time. I’m going to get the ingredients for these soon. I can’t buy them at the bulk store because I need them to be nut free, and bulk stores cannot guarantee that cross-contamination doesn’t occur. So I’ll have to buy pre-bagged ingredients from the grocery store. I have Salba (chia seeds) and hemp hearts that I can use in place of the flax and maybe the wheat germ. Thanks for sharing. I’m a teenager and I made them for myself so that I could have whey protein with me after exercising. My “extras” from the base were sunflower seeds, chocolate chips, chocolate whey powder, blueberries, almonds, and sunflower seeds. I couldn’t find wheat germ but they turned out fine anyways. I don’t like the small portions of store bought granola bars so I made mine thicker and wider. Next time I wont put blueberries in because it’s not my preference. I make this recipe for myself every two weeks. It is healthy, versatile and easy to make. Bake in an 8″x8″ square pan for chewier bars. @Joey: I don’t use wheat germ either… I use flax something or other (at the bulk food store) or bran (as in the stuff in the green box you use to make bran muffins). I don’t know if you folks have the Bulk Barn in the States, but it is awesome for this type of recipe. Thanks for the tips everyone! Next time I’ll be adding some protein powder to the mix. The good: This food is low in Saturated Fat, Cholesterol and Sodium. It is also a very good source of Manganese. Of course by following some of the substitutions like not putting in the brown sugar and substituting apple sauce of oil, you can lower the fat to 1g per serving and the sugars down to 10 g per serving. The cranberries and raisins are the biggest sugar contributors with 1/3 cup of cranberries has 26 g of sugar and 1/2 cup of raisins has 49 g of sugar. Nuts are probably a better choice less sugar and more protein, but also more fat….. Thank you so much for this recipe! So many granola bar recipes I’ve found elsewhere are all condensed milk and sugar -bleh. I have made these once or twice before and they were great! Hey, I am making your granola bar for my friends, but I want to find out how long can you keep the granola bar before it goes bad? And I want to know if it will become hard like a rock if I leave it out for 2 days? How do I keep the granola bars soft and chewy? Thank you for your response. Hope to hear from you soon! Thank you for sharing this fabulous recipe! I made a batch last weekend and my husband and I both loved them. They stayed fresh throughout the week in a plastic container. I’ll be making another batch today! My daughter has been using your wonderful recipe for awile now and we just love them. They are so delicious and full of so many healthy ingredients. It great to have an alternative to junk food that also tastes so good. We love them, chewy or crunchy. They are great for dunking in coffee or milk when they’re crunchy, so DEFINITELY a winner of a recipe!! Thanks so much. The point of this recipe is that you know where your food is coming from, not how many calories are in your food. children definitely don’t need to be worrying about that. This recipe is a great alternatinve to buying granola bars. And who knows what is in a store bought granola bar. This granola bar is made with whole foods and homemade. It is a great option. I just made these last night and they are awesome! I added sliced almonds for a bit of crunch. Next time I’m going to cut the sugar back again and try half apple sauce and half molasses. Thanks so much Andrea! Great recipe! I have also tried sweetening with a combination of molasses, honey and stevia to cut the sugar content. I find that with all the flavours, I don’t taste the bitterness that stevia sometimes has. I made them with applesauce, sooooo great! I’m waiting for the granola bars to finish baking in my oven right now :) and it looks soooo good. but it smelt really sweet before i put it in, should be okay? thanks for this awesome recipe! Made these granola bars yesterday with the addition of sunflower seeds, mixed dried fruit, and coconut to the original recipe. Soo good! My 22 month old daughter loved them! WOW! Loved this recipe, I used fresh cranberries that I cooked and added. I added sunflower seeds & walnuts and used coconut oil, much healtier than canola oil. Omitted the flax cause I was all out. I also added a little bran. Thanks so much for this recipe can’t wait for our 3 year old twin grand children to try these and get their opinion of this new recipe. Apparently, granola bars are a hot topic. Look good! Think I’ll add nuts just to be crazy and all. the edges looked a bit burnt in the photo…I’m betting these were pretty crumbly…not my idea of a winning granola bar! Try no bake granola bars…easier, taste better and stay together! what you’re seeing is a very browned raisin that was on the very edge. :) That being said, it is important to make sure the raw mixture is spread out evenly to ensure even cooking. Don’t judge it before you try it! It is actually very good. Bring butter, sugar and honey to a boil, simmer 2 minutes, remove from heat. Stir in the rest. Pack into a 9×9 pan. DONE! the “batter” tasted good when I was done, though! used some ground nuts and nut-butter, as I don’t have the kid/school/allergy thing to consider, and subbed some apple sauce in for oil, added molasses and an extra egg, very little brown sugar but with the raisins and craisins (not flavoured ones) – and some coconut I found, not enough for any other recipe – throw it in! – it definitely didn’t seem to be lacking in sweetness. thanks, all, for sharing your variations – this one’s a keeper! 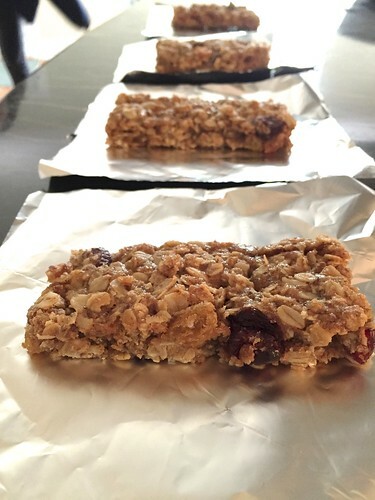 I’ve been making these granola bars since I found the recipe 2 years ago! They’re great! -Add coconut or whatever other nuts I have! This recipe is currently baking in my oven. :) The house smells delicious!!! I threw in a little more cinnamon and a few more raisins. Omitted the cranberries, as I do not have any and I threw in some bran for good fibre measures. :) I look forward to eating one soon!!! I have been making these bars for a couple of months now, I totally love them, and so does my 3 year old. He also loves making them with me…so they are just awesome all the way around. I have never made them the same way twice, but one thing I love to do is put half coconut oil and half veg oil, and then about a third of a cup of coconut. MMMM. Thanks for this great recipe! I made these but did not have the flour called for so I subbed in whole wheat flour and they still turned out great – my family is all over them and they will be a lunch box hit for sure. I am thankful for your tip to take them out a bit early if you want to slice them and have them stay a bit chewy. I am very happy with the result and posted the photo for my facebook friends, and now some of my friends will be trying them too! Does anyone know the nutritional value details of this recipe or how to figure it out? ^Kel: yup! look on the packaging of every ingredient that you used and just do the math for the amount you used. But honestly, because you are in control of what you are putting INTO the granola bars, I’m sure the “nutritional value” isn’t really necessary… juss sayin’. Thank you for this recipe, I have been sharing it with friends and with all good results! Its easy to make and my kids love it, they choose different things to go in it, and we use different sprinkles (just a little makes it more fun for them) to tell what kind is what! Also it helps the budget, we buy everything in bulk! These look great! I need a dairy-free, gluten-free snack for my son – will try these with rice or other GF flour, and perhaps almond meal instead of wheat germ. Just a note about flax seed. Our bodies can’t digest whole flax seed, from what I understand. This is why they need to be milled. BTW, I made these today, but substituted OAT FLOUR for the pastry flour and ALMOND MEAL for the wheat germ. Very, very delicious!! These were great! I didn’t have wheat germ so I added some oat bran n a lil more ground flax,I only used half the flour and half the oil.. n replaced with Applesauce. Added almonds sunflower seeds pumpkin seeds n raisins n cranberries! So good n a healthy filling snack :) thanks so much for sharing! I’ve searched for healthy homemade granola bars twice in the past month or two and found and chosen this recipe both times. They’re yummy and great! Thanks so much for sharing. AMAZING! i didnt use wheat germ because we couldnt find it at our local grocery store and they turned out fine! i used craisins in the place of raisins and they were soooooo good! Hi there! Just wanted to say that I was happy to find this recipe..I’m not much of a baker, and I attempted to make this one with my step kids today, and after a long 30 mins abbi (4 year old) got to have the first bite..and immediatley spit it out on the floor! I tried a bite, and it was so incredibly salty I had to spit it out as well….I looked back at the recipe online and compared it to the one I wrote out by hand ..and came up with a MAJOR error. I added 3/4 CUP of sea salt, as opposed to 3/4 Tsp. WOW..so now it’s back to the store for more rolled oats, and back to the mixing bowl for round 2!!!! Just put these in the oven – can’t wait to try them! I was looking for a nut free granola bar recipe and voila this was one of the top google results! I substituted 1/2 a banana for the egg as a girl in my son’s class has severe egg allergies – so hopefully they still stick together okay! If they do, I’ll definitely change up some of the oil for applesauce next time, just didn’t want to tinker more with the liquids first time around. I will try reducing the sugar as well, as the batter was delicious but I think could do with less sugar and you wouldn’t miss it at all! Could they be made without the egg? We have an egg allergy in our house. I made these last week and they were all gone within 4 days (my boyfriend and his colleagues absolutely loved them). I did add more honey (1.5x more honey), 1/4cup of chia seeds and substituted the flour for an equivalent amount of almond meal with 1/4tsp of xantham gum. They were very limp but terribly delicious. I think I’ll add less honey next time. my kid loves these. I subbed some chia, hemp, sesame and sunflower seeds in place of 1/4 cup of the flour and threw in a couple tempting mini choc. chips. awesome. thanks. I’m going to make these, but do you think coconut sugar can be used instead of brown sugar? Did you ever make them with a different type of oil? Still a staple in our lunchboxes for school! I have now halved the oil and use applesauce for the other half. I also half the honey and brown sugar, and add a really ripe banana. I always make a double batch so there are some for the freezer to take out! Like the idea of adding chai as some suggested above – next time! Thanks Andrea for the recipe! I made it, subbing honey for maple, and for the dried fruit – 1/2 c both dried cherries and apricots. A huge hit in our house. A mom win! I made these today but had to substitute choc chips due to an unreasonable aversion to chewy fruit, she loves them.